A movement is changing the way we learn and work. Bring a Maker Space to Cairo, help support DIY culture and entrepreneurship! 186 backers pledged $8,169 to help bring this project to life. We want to organize a fully immersive three-day Maker/Hacker space at Maker Fair Africa in Cairo, Egypt, but we need your support to heat the soldering irons and power the circuits! Imagine a place that integrates art, science, and technology into a great startup culture; open to all curious humans of all skill levels and all ages; and supported by Egypt's finest makers. Our goal is to establish a full-time Maker/Hackerspace in Cairo -- and more throughout Africa! "... Africa’s most innovative makers of things – engineers, artists, designers, entrepreneurs, tinkerers & hackers – prepare to incubate their inventions in Cairo, Egypt, during a three day creative fair that includes a public exhibit, professional workshops, social meet-ups, project mashups, competitions and more." 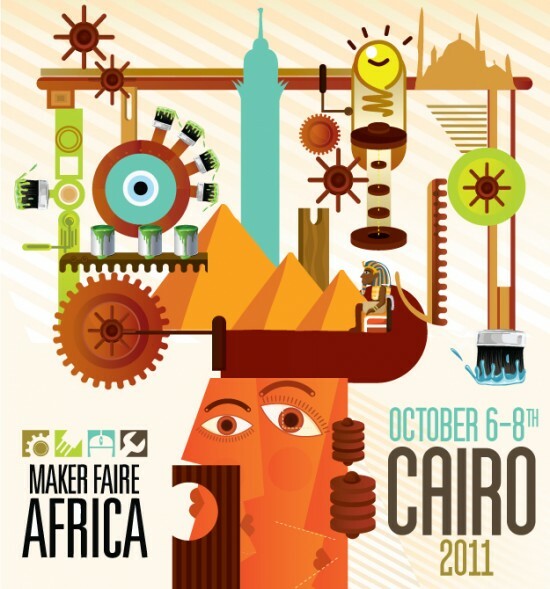 We* are flying to Maker Faire Africa to run a three-day maker space with help from Cairo's existing hacker space crew. We want to let to show attendees the idea that they could have a maker space year-round. We are providing the tools and environment to simulate what a maker space feels like. We will provide Arduino workshops, 3D printing workshops (thanks Maker Bot! ), Drawdio music instrument making workshops and silk painting workshops. We hope to establish more to come as we get in contact with additional Egyptian makers. *Bilal Ghalib from Ann Arbor, MI, Mitch Altman from San Francisco. Promotional material for the event. Travel and hotel money for two weeks while we conduct a survey of local makers. Material costs for the maker space: scarves, wires, paint, electronics. Making some cool laser-cut and screen-printed stuff! A nice microphone for the audio quality during our interviews. Phase I: We will expand the existing Egyptian dialog on maker spaces between people like Tarek Ahmed and Hussein El Said by co-hosting hacker space meetups the week leading up to the event and the week after. Mitch and Bilal will share their extensive experience in starting and supporting hackerspaces. We are focusing on finding as many women makers and entrepreneurs as possible as we are interested dispelling stereotypes nationally and abroad about who makers are. We will interview local makers and publish video of the creative DIY open sourced attitudes in Cairo and Alexandria. The six days before and after the Three Day Maker Space are a part of a survey of the support for maker culture and entrepreneurship in Cairo. We hope to discover the infrastructure and people that exist already and compile a list of resources and bridge the gap between makers in Cairo, Alexandria, and the rest of the world. Phase II: The second phase built around a revolving micro loan to help bootstrap these spaces. We will accept applicants we have found during our exploration. Please donate even if we've reached our goal! Any money that goes over the needed amount will go towards a fund that will continue circulating, supporting makers in emergent nations. This loan will be available for people like Tarek and Hussein to use for their initial build out and installation of tools. This resource will help create a space that adds value to its members' lives, which will make their monthly donation meaningful. And this, in turn, helps the lives of the greater community. Why Cairo? Why maker spaces? The technologically savvy young people who banded together and overthrew a dictator are exactly the types of passionate people who can benefit from a maker space. There are as many kinds of maker spaces as there are spaces themselves, but they all are spaces of empowerment and ability. Although the hacker spaces of the world have been helping to provide internet access to people in Cairo and Syria when their governments clamped down on them, it excites me even more to see what the brilliant people of Egypt will come up with when they are given the ability to make almost anything with almost nothing. Maker spaces around the world provide a community of passionate people who love to share what they know with the rest of the community. Maker spaces have banded together under the banner of hacker spaces and have been providing more and more people every year with community, tools, learning opportunities and personal development, enthusiastically sharing and exploring what they love to make and do. These things are the very foundation of a person ready to change the world. Hello! We're GEMSI, the Global Entrepreneurship and Maker Space Initiative: a small international team of makers, hackers, entrepreneurs, artists, and lovers with a mission. Our core team has been building communities and helping organize hacker spaces for years. Put simply, our focus is encouraging the development of democratic maker communities to stimulate and support passionate makers and entrepreneurship. The volunteers supporting this effort are: Bilal Ghalib from Ann Arbor, Michigan; Mitch Altman from San Fransico, California; Tarek Ahmed from Cairo, Egypt; Sarms Jabra from Chicago, Illinois; Zelda Moran from Montreal, Canada; Manal Jameel from Alexandria, Egypt; and more. To Maker Faire Africa for supporting this project with your gracious hosting of The Three Day Maker Faire and your initial financial donation. Thank you to The School Factory for fiscally sponsoring our project and letting us take tax deductible donations! Thank you Tarek for being so passionate and running with this project from day one. And thank you to all the volunteers for their time and effort. And each and every one of our donors for helping out. Don't be a stranger! Keep in touch! All donations are tax deductible through the non-profit organization The School Factory. You'll get a sticker with the GEMSI bridge connecting you with other supporters. Wear it proudly! You'll also be featured as a supporter on GEMSI's website. You get the GEMSI Sticker, your name on the website and a t-shirt with the GEMSI bridge on it! It will be hand screened on Alternative Apparel (trust me, you'll like the fabric, it's kitten soft!). You'll appear on the little fast moving credits from the cinema - you know like a stunt man or something - for all the video content we will produce. Get the sticker and a CUSTOM hand printed GEMSI tee shirt printed by me, Bilal Ghalib on ultra soft and delightful Alternative Apparel TShirts! Add any text based message you want above the GEMSI bridge logo. For example: "Bilal Supports:" [insert GEMSI here] or "Makers Unite!" [insert GEMSI logo here]. Ps. This is an awesome chance for you to be creative and get a true one of a kind gift for a geeky friend. Get the sticker, the shirt and Mitch Altman's slightly subversive, and ultimately practical TV B Gone remote control. Turn off or on any TV anywhere. Ever been at a noisy restaurant and wished you could turn off the blaring tv? Now this is amazing. Get an original hand painted scarf with a design of your choosing by Manal. Manal is one of the female artist and entrepreneurs who will be helping GEMSI by running fabric modification workshop! She's wonderful and talented! You'll also get the GEMSI shirt, and the sticker! Here's another tip for a great gift (check the delivery date ;). Not only will you receive the GEMSI sticker, shirt, and a TV-B-Gone you will help participate in the events as they unfold through 5 Skype conversations with the GEMSI team on the ground and access to our email and attuned attention. Do you love the project so much you wish you were a part of it? Well for the price of a plane ticket you can participate fully without having to deal with the TSA!